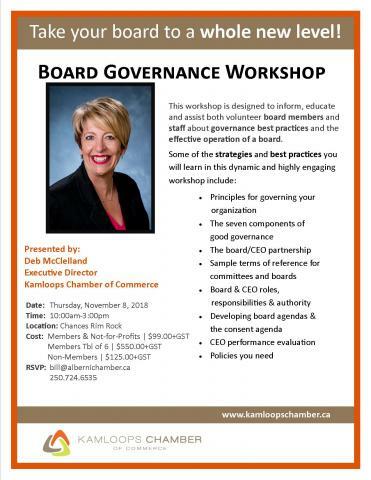 Join us on Thursday, November 8th at Chances RimRock as we host a long overdue Governance Training Program hosted by Ms. Deb McClelland of Kamloops BC. Ms. McClelland is the go-to trainer for Governance across the Province. She knows her stuff! Your Board of Directors should absolutely consider this training. Training will run from approximately 10:00am to 4:00pm and will include a light lunch. When selecting payment options there are three choices: Individual at $99.00 plus TAX for Members of the Chamber of Commerce, Table of 6 at $550.00- again for Members of the Chamber of Commerce. Individual purchase option of $125.00 for NON-Members of the Chamber.